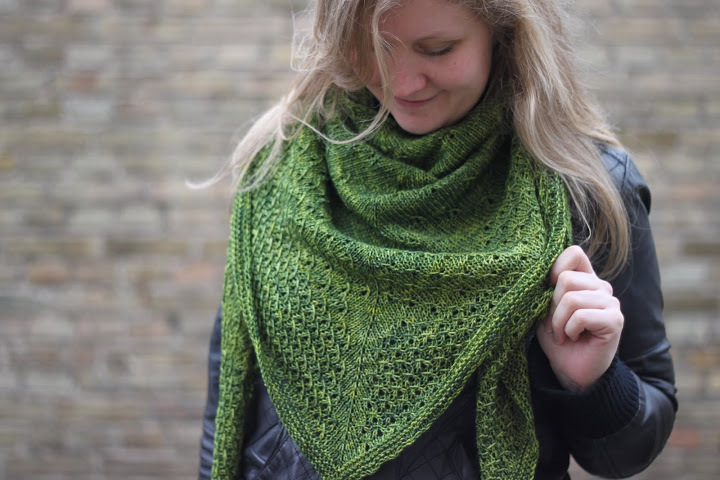 One of the people in my knitting group test knitted a shawl a while ago – Syrma by Cailliau Berangere / L’île aux fils. When Christina showed it to us, everyone gasped and exclaimed we wanted to make that too (which isn’t a weird thing, as Christina’s projects are always amazing! She has the greatest taste in colors and patterns.). So, our first KAL was born! I had a hard time choosing colors, but ended up with Madelinetosh Sock in Jade, which I had fallen in love with and impulsively purchased only months ago. That’s a very quick in-and-out-of-the-stash for me, considering that I didn’t buy it with a specific intention to start with! 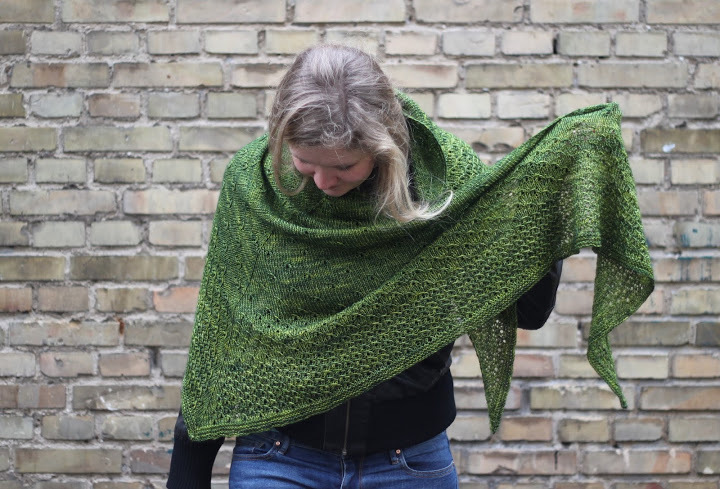 Syrma is a fun shawl with very pretty details, which makes sure you aren’t getting bored. However, you also need to keep on your toes – stitch counts are important, else the “stars” won’t align correctly and it will look odd. I got a hang of that quite quickly, but it only happened after some moments of puzzlement and tinking back. 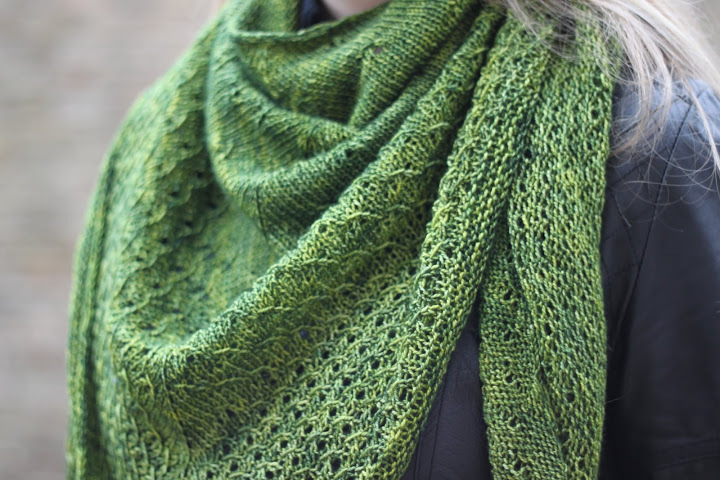 Getting towards the end, I could see that my 2 skeins of yarn might not be enough for the whole shawl as stated… Christina used approximately 1,8 skeins, so I had thought that I (knowing I knit loosely) would have enough, if not plenty, in 2 whole skeins. The garter stitch edge is supposed to be 20 rows in total. Fast forward to a couple of days later, when I in the morning put out the shawl to block. I was laughing out loud – no wonder I ran out of yarn on the way! Can anyone say “giganormous shawl”? 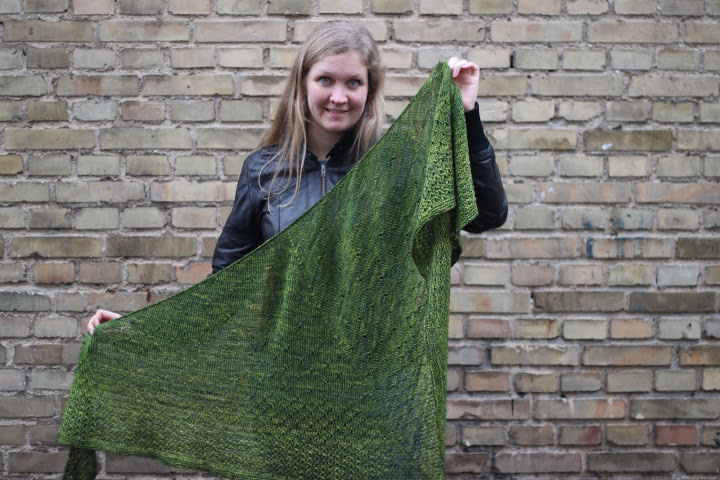 Before blocking, it was a generous 150 cm in wingspan, and 58 cm deep at the center point. When I pinned it out, it suddenly became 204 cm x 76 cm. Compare that to the measurements in the pattern: 175 cm x 66 cm. In any case, I love this shawl, and I love the gradual increasing of the little star pattern stitch. It’s perfect to wrap yourself in, warm and soft and cozy! Check out my project page on Ravelry for more info and pics.